This kit contains the NucView®488 Caspase-3 Substrate and the MitoView™633 mitochondrial dye. 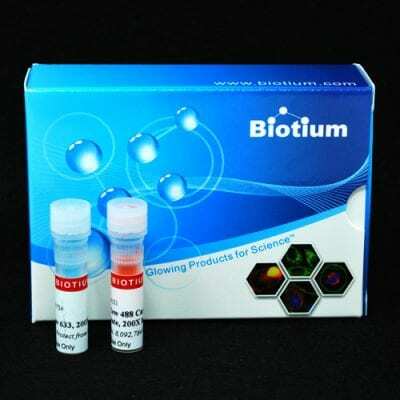 The kit provides a convenient tool for profiling apoptotic cells based on caspase-3 activity and changes in the mitochondrial membrane potential using either fluorescence microscopy or flow cytometry. The bi-functional NucView®488 Caspase-3 Substrate is able to detect both intracellular caspase-3 and at the same time stain the cell nucleus, which is known to undergo morphological changes during apoptosis. MitoView™633 is a far-red fluorescent mitochondrial dye. The staining is dependent upon the mitochondrial membrane potential; thus, apoptotic cells exhibit a much lower MitoView™633 dye staining compared to healthy cells. Furthermore, the spectral separation of these two dyes minimizes fluorescence overlap. Note: The optimal detection settings for MitoView™ 633 are the same as for Cy®5 and other far-red dyes. However, the dye also has visible red fluorescence and can be imaged using Cy®3 settings as well. As a consequence, the dye cannot be used for two-color imaging with other red probes. See our full selection of NucView® substrates and kits. For more information about NucView®, see the NucView flyer and reference list under the downloads tab, or see the NucView FAQs. Untreated Jurkat cells stained with the NucView® 488 and MitoView™ 633 Apoptosis Kit. 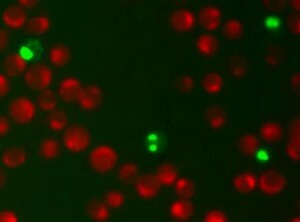 Healthy cells with intact mitochondrial membrane potential stain with far red MitoView™ 633 mitochondrial membrane potential dye (red), while apoptotic cells stain green with NucView® 488 caspase-3 substrate, and do not stain with MitoView™ 633. 1. Cen, et al. DEVD-NucView488: a novel class of enzyme substrates for real-time detection of caspase-3 activity in live cells. The FASEB Journal published online February 8, 2008.